He wasn’t a professional, or at least he wasn’t a regular competitor like the others. He was, however, a member of a recreational running club, entering the occasional race near his home outside Charleston, West Virginia and elsewhere. Here’s the story, from the summer of 1975. Worley Stout of Cross Lanes hasn’t gone around the bend, contrary to appearances. What other man would run barefoot about 11 miles on his 51st birthday? It’s all so simple when he sits down and explains why he shucks off his shoes. “I think I can make better time without shoes,” said Stout, a staid sales engineer for Westinghouse Electric Corp. who, when he’s tending to business, deals in electrical apparatus to industry and coal mines from a Charleston office. 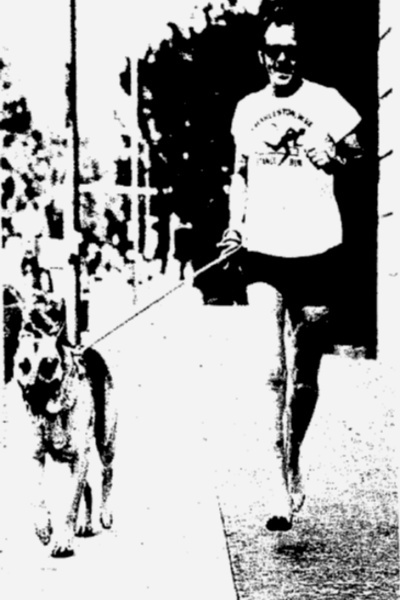 Stout began running without shoes by accident during the inaugural 15-mile Charleston Distance Run in 1973. His new shoes were causing him so much anguish in the latter stages of the Labor Day Weekend grind that he unloaded them at an aid staon and hot-footed the remaining 3 to 4 miles to the finish. By design, he wore shoes to cushion the impact of going up and down the South Hills portion of the 15-mile run on his birthday last year and then went the last 11 miles barefoot. What’s more, Stout covered the 15 miles in one hour and 56 minutes to win his age class for West Virginians in the distance run. Running barefoot hasn’t been a complete mattress covered blessing to Stout. At the 20 kilometer Kidney Foundation Run June 29 at Akron, Ohio, Stout did the first loop of 6¼ miles in shoes. That event marked the second of three consecutive weekends of competition for the member of the Kanawha Valley Road Runners. Around that, he won the over 50 class in a Kanawha Valley Road Runners’ 9-mile run on Poca River Road near Cross Lanes and was second in the 50-54 class in the St. Albans 10,00-meter Town Fair Run. All this came after he returned a bit out of shape from surgery to have varicose veins removed from his left leg. (A hereditary ailment that played havoc with his running/jogging regimen). Stout’s running companion is Rommel, a three-year-old friendly German shepherd. At the Poca River runs, especially, Rommel is the star attraction, dashing back and forth as the gap widens between participants and flopping in puddles of water to, cool off. RUNNING BAREFOOT on the streets of Charleston is quite natural to Worley Stout. His companion is Rommel, a huge but friendly German shepherd. For each published barefoot runner (in any era) there are certainly many who just do it in their spare time without taking part in competitions or belonging to a club and never show up in the media.